The United States and Mexico share nearly 2.000 miles of common border. Nearly 10 million people live along this border. As estimated 300 billion dollars worth of goods flow across the border between the two nations, mostly through the 25 ports of entry. Everyday, close to 1,000,000 people enter US from Mexico through the various ports of entry. Most of these people return to Mexico after work or visit along the border towns and use special laser Visas to cross. The growing cross border traffic not only causes excessive congestion and delay, but also poses security problems for Customs and Border Protection (CBP) agents. The long lines of traffic and excessive delay situation has worsened because of increased inspection in the wake of 9/11. The Secure Electronic Network for Travelers Rapid Inspection (SENTRI) program is designed to minimize delays and provide a faster way to cross the border for certain low risk daily commuters and frequent travelers who undergo thorough background check before SENTRI pass can be issued. The program also provides tremendous security benefits, because the system removes the pre-cleared, low-risk traveler from traditional inspection lines, enabling CBP agents to focus on other travelers. Sarakki Associates Inc. (SAI) was responsible for the design and deployment of the SENTRI system at the following six key Ports of Entry (POE) along the 2,000 mile US-Mexico border. 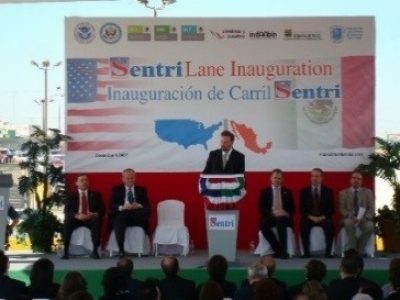 The proposed SENTRI improvements are direct result of 21 point agreement between Mexico and US signed by US president George W. Bush and Mexican President, Vicente Fox. 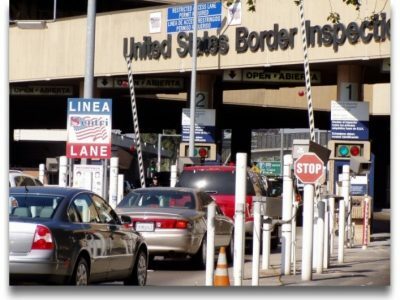 The program will reduce the average time to cross the US border from approximately 90-120 minutes to 4 minutes depending on the demand for crossing at a particular port of entry and color of the terror alert level. The program is a win – win situation for both commuters and the US Government. The commuters spend less time waiting in line in 120 degree Fahrenheit summer heat in the Southwest and for the US government the project enhances border security by bringing thousands of people under its purview.